CATAPULT TACTICS AT GRAFHAM 2009: starting in a mixed fleet in fresh winds. The line is well-laid at right angles to the wind, so there are different starboard-start options for the Catapults. Paul and Alastair (503 and 513) are using conventional tactics, easing along slowly to pass close to the Committee boat. This keeps the advantage of a safe position (with starboard rights over the fleet) and they will be close to the line on the gun. Moving slowly in the disturbed air of larger fleet risks stalling (and this happened to them both in Race 2 at Grafham) and accelerating away may be slowed. Gareth (91) is using a high-speed start, staying a long way back, and above the close-hauled line, coming down fast to the gun. The advantage is starting at speed, and usually having a clear run in. Boats trying a slow-speed start (503 and 513) may sag down enough to leave a gap at the Committee boat, but in any case Gareth should be able to follow them and then use speed to climb a bit to windward over them. A big Catapult start in light winds (at the 25th Anniversary Bala Gala in 2008) The shore-based start has a slight starboard bias, so the shore end gives some distance advantage, and everyone is starting on starboard. Around 30 seconds from the start 271 (white hulls) seems to have the best place, heading to pass just inside the mark. 513 and 17 have contested the starboard end, but have finished up in poor positions blanketed by 271 and an obscured boat. 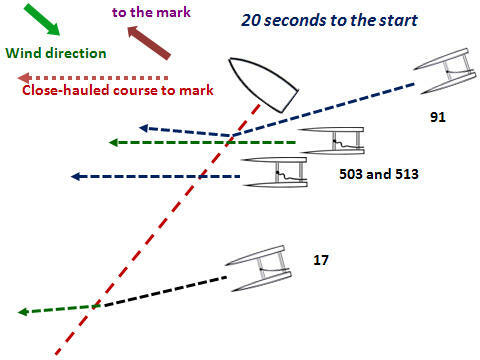 As there are clearly some seconds to go, they may be best bearing away (if they can avoid boats below them) to cross at speed further down the line. Several boats have been content to approach the line further down, and Nigel in 522 looks settled and concentrating on his own race. Further away, Alex in the distant yellow-hulled Catapult 1 on the right is hovering near the line, pointing further up into the wind. Yellow hulls coming in from the left (518, obscured) appears to have left it too late, but also has the problem (if he gets there in time) that 271 will not need to give him any room at the mark. Following 271 across going quickly may be a good option still. 522 has got away well and Alex in 1 is turning and hauling in to accelerate away. They each have space, so can concentrate on boat speed. 271 is no longer in control, as boats below him have tightened up to the line, and Paul in 307 has had enough clear breeze to come up to the line on a close-hauled course to take the pole position, so that 271 has had to hang back. 513 and 17 (orange hulls, now obscured) have made little progress, showing that in light winds, being stuck in a pack will take a long time to disentangle, so that contesting the obvious favourite spot has to succeed, or be replaced by a cautious alternative.